This paper has two parts. Part-I consists of 50 objective questions common to all, which is compulsory and carries 2 marks each. 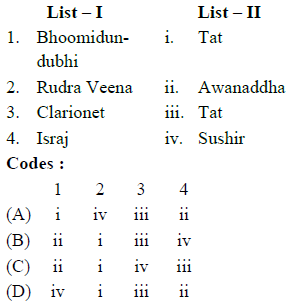 Part – II has Four sections viz Part II, Part III, Part IV, Part V – Hindustani, Karnatak, Rabindra Sangeet and Percussion Instruments with 25 questions each of 2 marks each. Candidates should select any one of the Part II / Part III / Part IV / Part V as per his / her discipline. 2. ‘________ wires were in Vipanchi veena’, said Bharat ? 3. In which vocal system, Bhasha-Vibhasha are placed ? 5. Who is the writer of ‘Shringarhar’ ? 6. Which one of the following artists is not a Sarod Player ? 7. “Kan Gujari” singer are related to which state of India ? 8. In which capacity, ‘Pancham’ is transferred from its own place in Madhyam Gram ? 9. 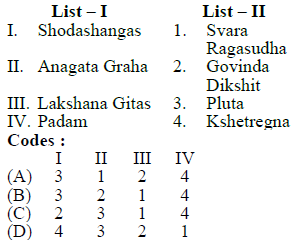 How many swaras are used by Pt. Lochan in his Ragas ? 11. Whose work is “Meeting by the River” ? 12. ‘Ektantri’ Veena was called by which name ? 13. Who has composed ‘Raagkadamb’ musical composition ? 15. Aamad is a technical terminology of which of the following art ? 16. ‘Pramaan Shruti’ is placed on which Shruti ? 17. Sitar has evolved from which of the following instruments ? 18. Which one is the instrument without Sarika ? 22. Which one is not mentioned in eight rasas of Bharat ? 23. Which one is in right form of ‘Praman Shruti’ ? 26. Who was the inventor of Raag ‘Laajwanti’ ? 27. Which raga is composed with Komal Nishad in Shudh Nath ? 28. Who was the inventor of Gramophone ? 29. ‘Budhva Mangal’ music programme is related to which city ? 31. Which artist has established Maihar Band ? 33. How many Banis are in Dhrupad ? 34. Which Raagas are mixed in Raag Jog ? “Sa N.i dh.a N.i Ga Re, Sa Re, Ga, Ma, Pa” belong to ? 38. 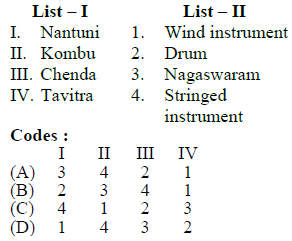 Assertion (A) : Sahitya is of secondary importance in Absolute music. Reason (R) : Sacred music belongs to the sphere of Absolute music. 41. According to Tagore, which instrument is not appropriate for accompaniment with Rabindra Sangeet ? 43. Which one is the biographical presentation of his life written by Rabindranath ? 44. How many matras are in ‘Teora’ Tala ? 45. Which one is the sign of ‘Som’ or 1st matra of any Rabindrik Tala ? 47. In which city, Ali Akbar College of Music is situated abroad ? 48. Which percussion instrument is from Karnatic music ? 49. In Natyashashtra, instrument is called by which name ? 52. Bahadur Sen is related to which instrument ? 53. Which one of the following is frequency of Shuddh Dhaivat of Western Shuddh Swar Saptak ? 54. Who was the founder of ‘Chakrik- Prakriya’ for measurement of ‘Swar- Samvaad’ ? 55. Who was the inventor of “Shruti- Darpan Vaadya” ? 56. Which of the following is in correct order ? 58. 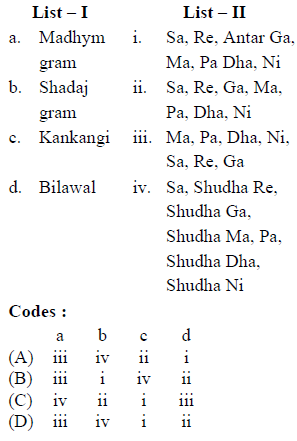 In which Puran the name of Kalpas are based on the notes on music ? 59. The kakali was related to which note in Bharat age ? 67. How many Bharatratna for Sushir Vadya ? 70. The music of Lochan’s period was based on which gram ? 71. Which instrument was prepared by Helmhotz for recognizing the ‘Anshikas’ of Mishra Swara ? 74. Who made the ‘Cyclic Theory’ ? Assertion (A) : Art in India was independent of Religion. Reason (R) : Temples have been repositories of Art in India. Assertion (A) : Grama in the ancient times was evolved only to find new scales. Reason (R) : Murchanas evolved from Jatis. 51. Shanta, Amar & Pramada are the characters of which Dance-Drama of Tagore ? 52. Who composed the song ‘He Antaryami, Trahi….’ ? 53. Who was the editor of ‘National Paper’ magazine ? 54. 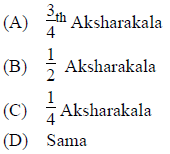 Which one is the correct divisional structure for Ada-Chartal used by Tagore for his songs ? 56. How many Matras are in Choutal or Chartal ? 57. ‘Nibira Ama Timir Hote’ song is based on which category ? 58. The following song is based on which category ? 59. The song ‘Tomar Khola Hawaye’ is based on which ‘Tala’ ? 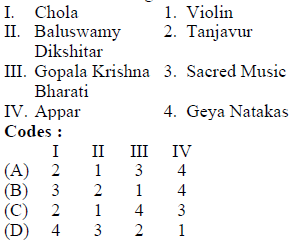 60. Who also played veena alongwith singing from among the following artists ? 61. How many divisions are in Sur Fak Tal ? 62. How many ‘Fhak’ or ‘Khali’ is in Tibra Tal ? 63. In accordance with the total number of matra, which ‘Rabindra Tala’ is similar to Hindustani tala ‘Rupak’ ? 64. How many songs were not composed by Tagore among the total 157 no. of songs in ‘Geetanjali’ ? 65. In the song ‘Tomar Asime….’ which ‘Vivadi Swar’ is used to make this composition ‘Raga Bihag’ ? 67. Who received the title of ‘Rangraj’ & ‘Tanraj’ ? 70. How many divisions are in ‘Naba Taal’ ? 71. ‘Jat’ tal is divided into how many divisions ? 72. ‘Ore Natan Yuger Bhore’ song was composed to celebrate which occasion ? 73. ‘Aaji Subho Dine’ song is based on which ‘Tala’ ? 74. ‘Ei Udasi Howar Pathe’ song is based on which category ? 75. ‘Aaji Praname Tomare’ song is based on which ‘Tala’ ? 51. Who among the following was a renowned artists, who was a good Tabla player ? 52. 9/4 indicate which layakari ? 53. On which beat 3rd Tali of Shikhartal is placed ? 54. Which Rishi is associated with Pushkar Vadya ? 56. Which one among the following is not the category of Jati ? 57. 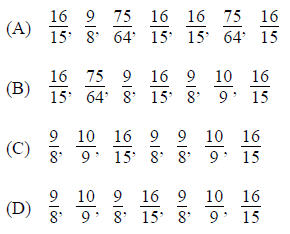 Which is the shortest unit of Tal ? 58. Who was the Guru of Karamat Khan ? 59. Which is not a category of Tihai among the following ? 60. By which tal Tappa Gayaki is accompanied ? 61. How many beats are there in the ‘Navpanch’ tal of Rabindra Sangeet ? 64. Which renowned tabla player was expired recently ? 65. In which of the Gharanas, the playing of description of theka is performed ? 66. Which Tala has different varieties ? 67. From where, Kuad of Rudra tala will start ? 68. In which university, dept. of tabla or percussion, instrumental is not separate ? 69. ‘Dhama’ the instrument like tabla is used in which state ? 70. From which Matra, the composition of Maseet Khani get started ? 71. In which Tala, Farmaishee Chakkardar of Jhaptala will be played without any change ? 72. In which Tala, playing is possible without any change of Kamali (minimum of seven circles) of teental ? 73. Which Pakhawaj Player has resided in Kashi for a long run ? 74. Which Mridanga player is renowned as eminent of Laya ?